The northwest has been timber country for 150 years. 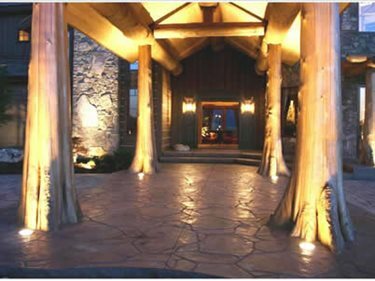 Today, logs remain the material of choice for large custom homes, and concrete provides the perfect complement. 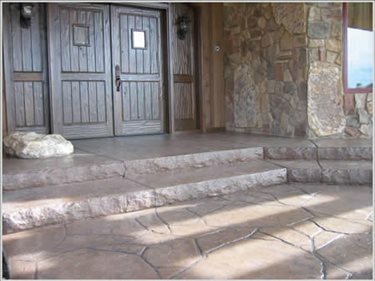 At this home in Spokane, Washington, Fred Glisson's Riverstone Stamp Concrete has created a look that elegantly reflects the area's history. This was one of the homes on last summer's Street of Dreams tour held in the Spokane/Coeur d'Alene area, which presented six spectacular show homes priced at up to $2.5 million. All the homes were located at the top of a hill overlooking the Spokane Valley and Liberty Lake and the tour attracted over 30,000 visitors. The entryway columns on this home are made from big 210-year-old cedar trees that were scraped and sandblasted and positioned to appear as if they were actually growing out of the concrete. Beneath the trees is an 18-inch-diameter footing formed using a Sonotube. Holes were drilled into the bottom of the tree trunks to match up with dowels extending from the footings. Riverstone wrapped the tree roots with a press and seal material, a heavy-duty plastic wrap. "We poured the concrete so it flowed around the tree root then we came back and cut it so it's nice and clean against the tree root," Glisson said. 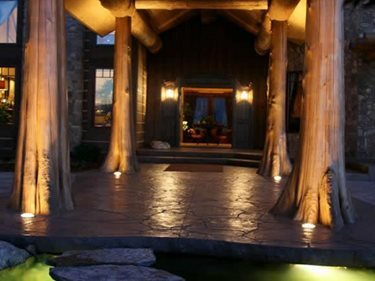 "We isolate the trees from the slab using the press and seal, then we poured the slab around it and installed recessed lighting in the stamped work to shine up on the trees and enhance the effect." The final step is to saw cut the joints with a Soff-Cut saw. "We've done it with tooled joints," said Glisson, "but the Soff Cut provides a cleaner look." 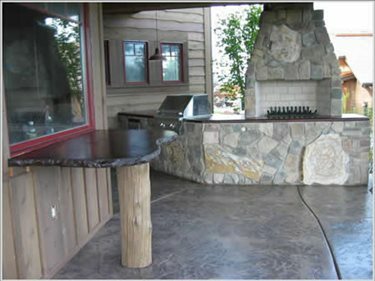 The slab is stamped with an Arizona Flagstone stamp from Proline. The concrete was made with aDavis integral color and Riverstone workers used a medium gray powder release during stamping. After they washed off the release, they returned to use a black grout to hand grout all the stamped joints to make it look like real stone. 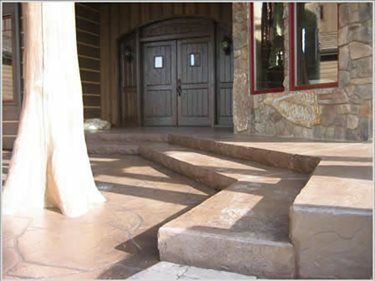 On risers for the front steps for this home, and on the stamped sections that cantilever over the ponds, Riverstone used a Brickform step riser form when pouring the slab. "That's hard to do," said Glisson. "I haven't seen anyone else do it. We did it partly just to show it could be done. The riser form is great but it can only be used for one step at a time--since it's 2 inches thick you can't get underneath to stamp the tread to do two steps. So we did the first step then came back and drilled into that and did the second step. Everyone asks how we stamped that face, but it's not a stamped it's a formliner." The stamped sections of the entryway cantilever out over the pond so that the water is actually underneath the stamped concrete. "It takes a lot of work and a lot of thought," said Glisson, "but we got a lot of recognition for it so it was worth it." 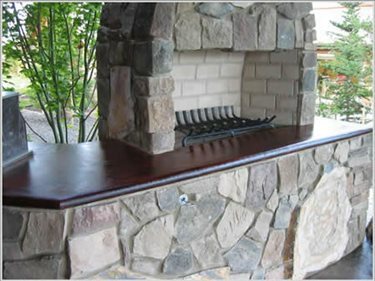 On the back patio Riverstone used a Roman slate texture pattern and made cast-in-place concrete countertops. "One was a Stegmeier form with the Encounter mix and the other was from Fossilcrete with the 2-inch chiseled-edge look," noted Glisson. Glisson started Riverstone in 2001 after having spent several years as a contractor installing plain flatwork. 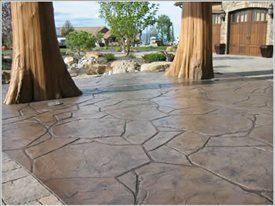 He recognized that in the Spokane/Couer d'Alene area there were a lot of custom homes being built and that there was a need for a good decorative concrete contractor. "I took a lot of seminars from Doug Bannister down at the Stamp Store and I read lots of articles on decorative concrete," he said. "I did the research and got the education and that has allowed us to do the kind of work that separates us from everyone else."